by Robert T. Boyd (Editor), Kenneth M. Ames (Editor), & Tony A. Johnson (Editor). 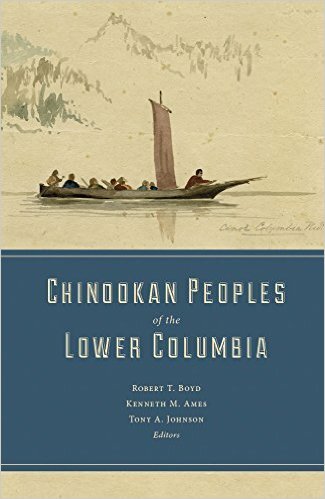 Chinookan peoples have lived on the Lower Columbia River for millennia. Today they are one of the most significant Native groups in the Pacific Northwest, although the Chinook Tribe is still unrecognized by the United States government. 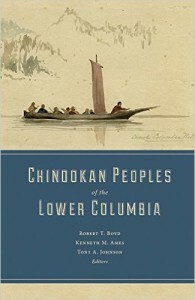 In Chinookan Peoples of the Lower Columbia River, scholars provide a deep and wide-ranging picture of the landscape and resources of the Chinookan homeland and the history and culture of a people over time, from 10,000 years ago to the present. They draw on research by archaeologists, ethnologists, scientists, and historians, inspired in part by the discovery of several Chinookan village sites, particularly Cathlapotle, a village on the Columbia River floodplain near the Portland-Vancouver metropolitan area. Their accumulated scholarship, along with contributions by members of the Chinook and related tribes, provides an introduction to Chinookan culture and research and is a foundation for future work. Robert T. Boyd is a research anthropologist at Portland State University and the author of The Coming of the Spirit of Pestilence. Kenneth M. Ames is professor emeritus of anthropology at Portland State University and lead author of Peoples of the Northwest Coast. Tony A. Johnson is Chairman of the Chinook Nation.